Recently over at Retro Renovations.... they had a load a picture party. Which they do from time to time. They pick a great vintage - subject and ask for readers to load up their favorite picture. The last picture party was for Vintage dinette sets. The best part for me, after looking through all the pictures.... is knowing that they all reside in a home where they are safe and loved by their owners. I have picked out my favorites and added them here. 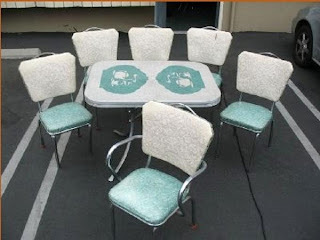 All of these are green dinette sets for the most part. 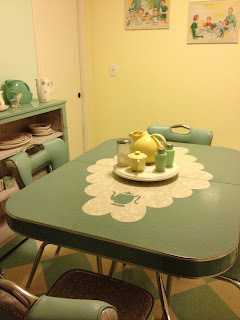 I have always had a soft spot for vintage green and yellow kitchen stuff. 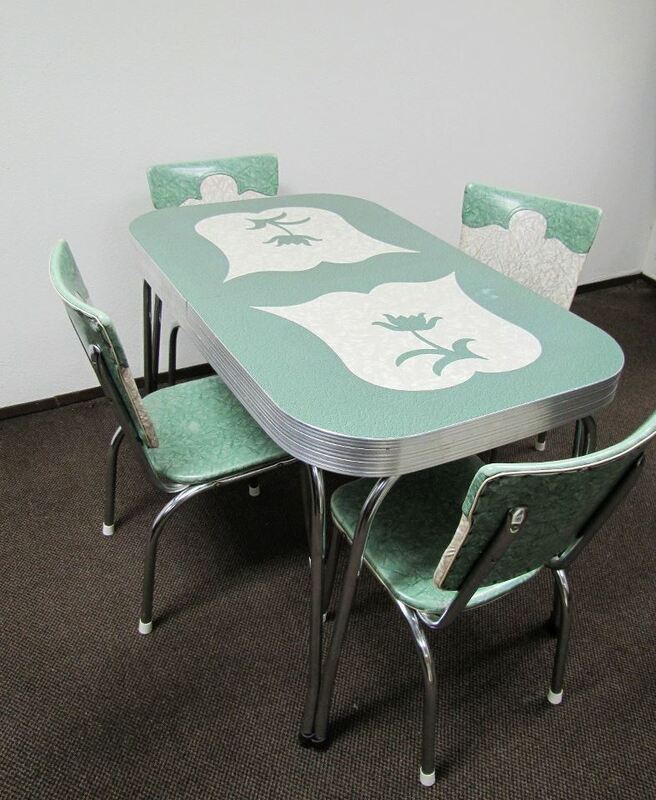 So these gorgeous dinette sets just take my breath away. I adore the theme of the teapots on these tables. 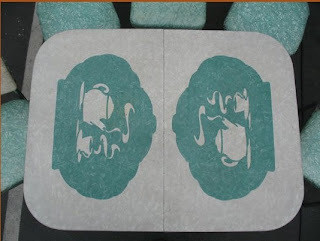 Then with the two tone cushions on the chairs, just compliment the whole look of these sets. Then this one is another teapot design... with the colors flipped. Look at the walls... see how the owner has used yellow paint on the walls to really compliment the green dinette set. Gorgeous. Then there were tulips! How magnificent. Notice how this set had the green going around the bottom of the table. Then again with the colors flipped. With green tulips this time.... I spy that the chairs have the two tone cushions! What a glorious set! I love bright cheery yellow. 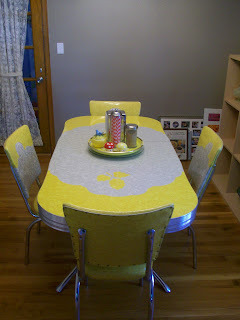 And it too has the two tone chairs in yellow and gray! Why don't they make these set anymore?? As in mass produced. The odd thing is.... if I do come across these vintage dinette sets. They always tend to be red. No joke. I have probably seen 50 red tables over the years. And blue ones too. But the green, yellow and pink table sets. I rarely see in the wild. And then there is this wonderful pink set. Pictures I have hoarded, forever. But this dinette set has rod iron black legs instead of chrome. It was for sell on eBay years ago. If it had been within two states of me... I would have bought it and dragged it home. And it even had its leaf! 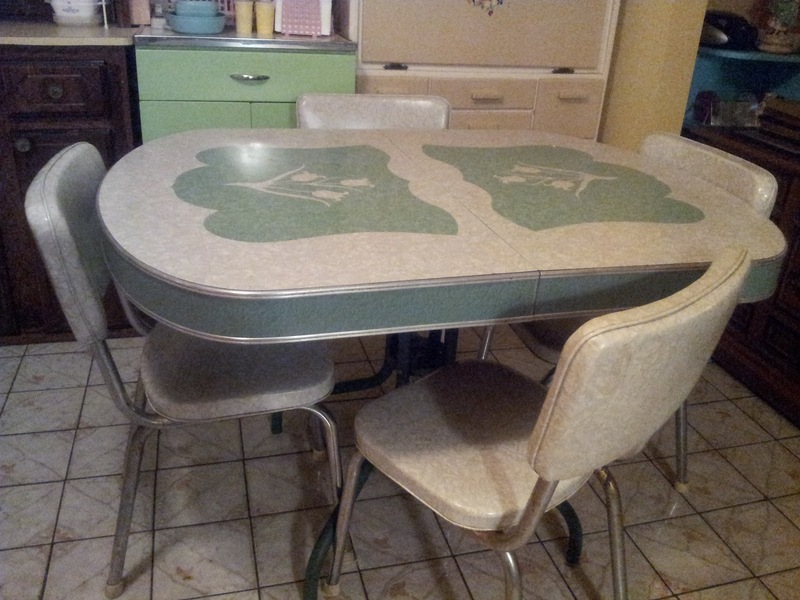 Now go over and look at all those stunning vintage dinette sets at Retro Renovations! It is worth the time to click through all of them and find your favorite!